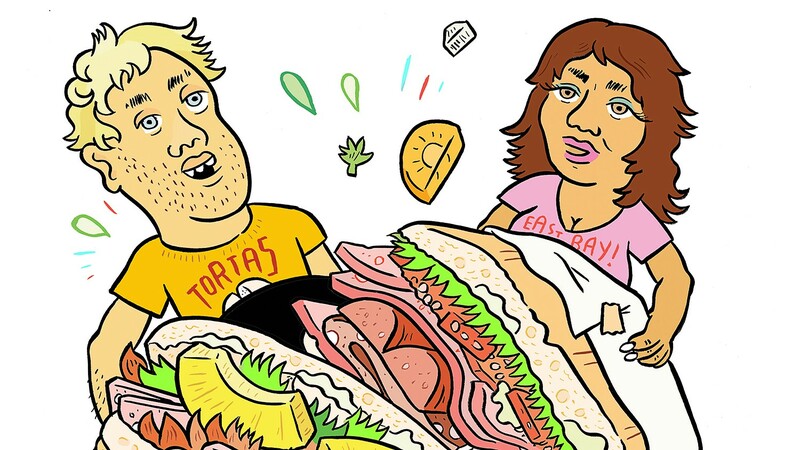 When it comes to Mexican food found north of the border, tacos and burritos reign supreme. But there's another menu mainstay that, while perhaps not as popular, still deserves a place in the comfort food hall of fame. The torta is simply a sandwich, but it's quite unlike the Italian sandwiches that dominate urban delis or the fried chicken sandwiches that are so trendy right now. Like many foods, it can be hard to define the torta, but all good tortas are made on bolillo or telera bread — savory buns and loaves baked in panaderias and made especially for sandwiches. The bread is toasted and dressed and packed with hot pork, beef, or chicken. Garnishes vary, but usually include avocado, pickled jalapeños, cheese, lettuce, and tomato. Although the historical origin of the torta isn't entirely clear, it's thought that the sandwich was first prepared in restaurants and roadside stands in the southern region of Mexico, especially Mexico City, Puebla, and Morelos. If the taco and burrito are rural border foods, the torta is urban and from the heart of Mexico. It's also thought that the torta was inspired by French immigrant bakers. Really, it's a hybrid food assembled from the ingredients and traditions of many cultures — European breads, Mexican tomatoes, chiles, beans, and meats of all kinds. West of Mexico's central cities, in the state of Jalisco, and especially its capital city Guadalajara, there is one remarkable regional twist on the torta: the torta ahogada. Assembled with a sturdier French roll-style baguette bread that is drenched in a spicy red salsa and draped in pickled onions or peppers as it's plated, the ahogada is eaten more like a giant wet burrito than a sandwich. What really sets the torta apart from its cousins in the sprawling sandwich family are a few ingredients that must be incredibly rich and fresh. In addition to bread baked that very same day, good tortas need to have Mexican mayonnaise. With the very best tortas, the roll is first spread with butter and toasted and then put on the grill after the mayo has been added, creating a warm creamy texture opposite a crispy crust. A true and excellent torta also must have refried beans, creating a velvety surface for the fillings to sink into. Then the meat, lettuce, tomatoes, sliced avocado, onions, and pickled jalapeños are layered in between the bread. Trust us when we say that this precise combo of ingredients — fatty meat, mayonnaise, beans, chewy-toasted bread, crunchy fresh vegetables, and spicy pickles — is what makes the torta of your dreams. If done right, with the proper balance of ingredients on a good-sized bread roll, a torta should fill you up. Some places build gut-busters that, if you devour the entire thing for lunch, ensure you won't be hungry for dinner. Other places try to moderate the size of their sandwiches, but the amount of food isn't really key. What's key is the richness of the ingredients. Also, don't be fooled by upscale establishments that try to pass off their concoctions as authentic tortas — some of the best tortas are found in the most unsuspected places. There's one other thing that makes a great torta, and it has nothing to do with the sandwich — it's the beverage to accompany your meal. While drinking an agua fresca is the norm when eating tacos or burritos, a torta's perfect companion is a jugo: freshly squeezed orange juice, carrot juice, or a combo of carrot, orange, celery, and beet juices known as a vampiro. Sadly, the East Bay lacks restaurants that serve good tortas, and finding a truly great torta is very hard to find. So, unlike with our taco guide (see "Oakland's Best Tacos Aren't Where You Think," 6/6/18), there is not an abundance of places to seek out. Nevertheless, we found a few East Bay spots that deserve praise. Located in a parking lot shared with a gas station and truck garage in deep East Oakland, Estrellas de Sinaloa is probably the best place to get a torta in the East Bay. It's certainly the star of Oakland. They make their sandwiches on telera bread that's properly toasted and slathered with mayo. The vegetable filling is better quality than at a lot of places — it's not iceberg lettuce and unripe tomatoes — and the meats are excellent. They build monster sandwiches here, so for $9.50 you're really getting two meals. Also, they make fresh jugos. And for extra bonus points, they were playing Vicente Fernandez and Chalino Sanchez when we visited. Their jukebox is hot! Worth the drive to San Pablo, this place is a vegan's nightmare — and that's why we love it. The sandwiches are gargantuan, among the largest we've ever had. Eat one and you'll fall into a food coma. You won't want to eat for a whole day after and your clothes won't fit right and you'll regret ever saying the words pierna or desebrada. Their telera bread comes in fresh, chewy, crispy slabs, and they're very generous with the spread and cheese. The stacks of meat are obscene. Order the torta Cubana if you're a glutton. At about $7.50 per sandwich, this is also one of the cheapest tortas. (But avocado costs extra.) They also make jugos, which is necessary in order to lighten the meal. This little sandwich shop lives up to its name — it's crazy good. La Torta Loca shares space with a laundromat in the heart of the Fruitvale's business district, and the door to the kitchen is open so you can watch and listen as they build your sandwich and grind carrots and beets into juice. The tortas are made with telera bread and include thin flavorful slices of fresh cheese. We asked for extra pickled jalapeños to stack on our sandwiches and they happily gave us a small bowl. Try to the Hawaiiana, which includes roasted slices of pineapple combined with jamon. Most of the meat here is of good quality, the prices are cheap, and the sandwiches, while not small, also don't leave you feeling over-stuffed. Also, they make great jugos. This old-school diner specializes in breakfast and lunch, therefore the torta has a central place on the menu alongside pancakes and eggs. In fact, a giant painting of a torta greets you at the entrance. Hornitos does everything competently, from the bread to the fillings to the spread. We especially enjoyed the torta de milanesa, a heavy sandwich built around breaded, fried steak, and the Cubana, which, like at most places, has a slice of hot dog in it. Hornitos also makes fresh juice, and with your abuelita's favorite telenovela playing in the background in a dining room painted a shocking hue of orange, it's impossible not to enjoy this place.